This bird just outside my bedroom window this morning sounded like a chattering squirrel. She was eating the millet seeds from the mix of bird food in the platform feeder. I took a photo and tried to figure out what she was. Her finch-like beak threw me off a bit, but finally I figured out she was a female Brown-headed Cowbird. 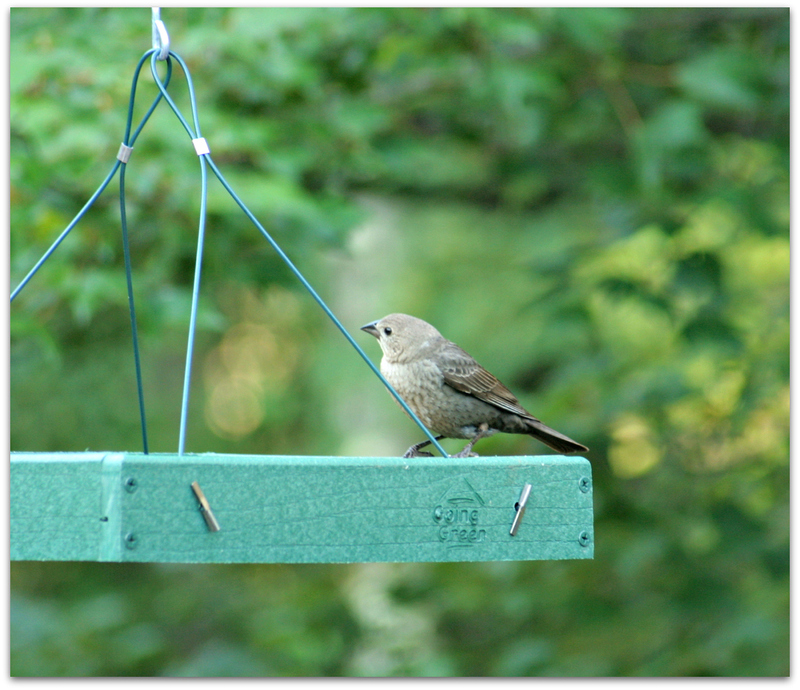 We have had two to four cowbirds visiting the yard and feeders a few times a week since spring, usually in pairs. Maybe this was a juvenile female. Wonder who her foster parents were? 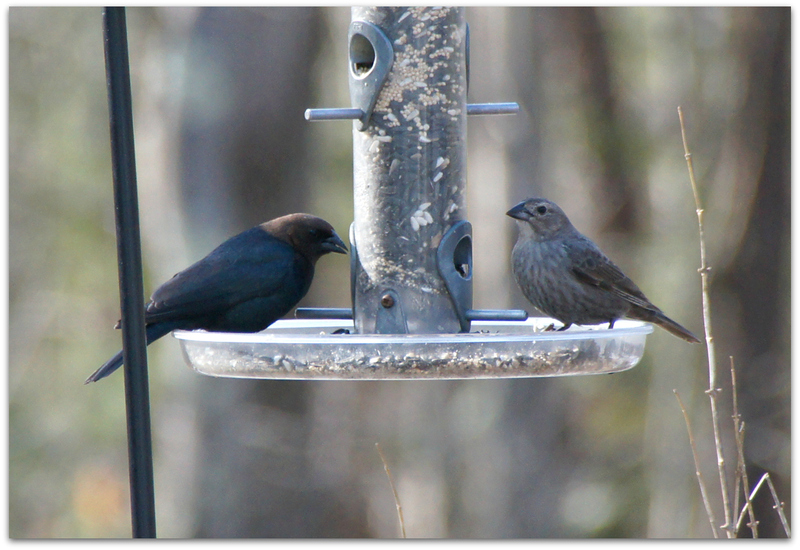 Here is a photo of Mr. and Mrs. Brown-headed Cowbird, taken in early April. They are very “chill” birds, slow to startle, deliberate and focused in their feeding, mixing easily with other species. I remember one spring day I kept an eye on a pair as they sat still for (it seemed) hours on a branch in the maple tree, staring at each other. Cowbirds earned their common name from the habit of following herds of buffalo (and cattle) in search of the insect prey that were flushed up by the large grazing mammals. Cowbirds have been called songbird chickens because they can lay more eggs than any other wild bird. A single female is capable of laying nearly one egg per day at the peak of the breeding season, and produces a total of 30-40 eggs over the 2-3 month breeding period (May-July). Cowbird eggs require an incubation period of only 11-12 days, whereas most host species require 12-14 days, and some as many as 17 days of incubation. Consequently, cowbird young hatch earlier than the host young, affording the parasite a distinct advantage in competing for food with its younger foster siblings. Fascinating stuff! All learned while sipping my morning (bird-friendly) coffee. This entry was posted in Uncategorized and tagged birds, Brown-headed Cowbird on July 12, 2014 by Amy.